Resurrection is the Society’s journal. With typically four issues each year containing articles on computer history and related topics in an A5 booklet format. It contains CCS news, articles, transcripts of seminars and lectures and other material. Resurrection now forms a significant and authoritative record on computer history - on the machines, on early applications, and on the people. 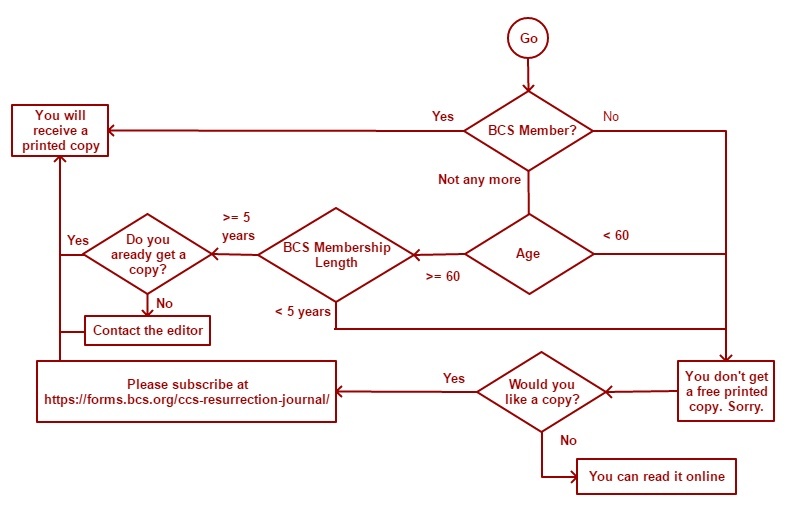 Members of the CCS who are also BCS members receive a free printed copy of the Society journal Resurrection four times a year as do any CCS members aged 60 and over who are also former-BCS members of at least five years’ standing. CCS members who qualify for a printed copy by virtue of their past BCS membership should contact the editor to claim their entitlement. Sadly our membership records are insufficient to enable us to identify you. Other CCS members are invited to subscribe to printed copies of Resurrection for the modest sum of £10.00 for four issues. Goto https://forms.bcs.org/ccs-resurrection-journal/ to subscribe for Issues 83–86. Please note that this is a change from previous arramgements. Once you have submitted your details to BCS, instructions allowing you to make the payment will be sent to you at https://forms.bcs.org/ccs-resurrection-journal/submit.htm which page can be re-displayed at any time. In any event you may read Resurrection online here and not receive a printed copy. All previous issues are available online. If you would like to have printed copies of back-issues we suggest that you go to the web page for the issue you have in mind and thence to the “PDF Version” which should give you the best facsimile of the original paper copy. Kindly note that issues 1-58 are set up for A4 paper, from Resurrection 59 onwards A5 paper is assumed and your printing options should reflect this. There is an index of issues below and then a composite contents list which allows you to go directly to individual articles.